For Local Flavor, the Hixson High students decided to highlight iconic sights and symbols of the Greater Chattanooga area. The Hixson entry represents Ruby Falls, Rock City, the Incline Railway, the Choo Choo, Point Park, and cultural icons like the Delta Queen and the Cherokee Water Spider. The Tennessee River can also be seen coursing over both shoes, bringing them together. 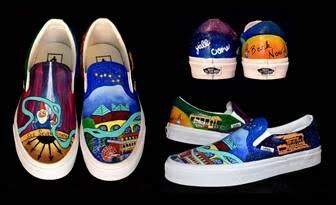 The Hixson students involved in decorating the shoes were Charlie Dickerson, Alia Smith, Michaela Roberts, Logan Summers, Addison Flannigan, Luke Pfennig, Jade Sharp, Amy Gonzales, Sarah Bargerstock, Josh Green, Tori Gifford, Jocelyn Salter, Suhani Patel, Amanda Lin, and Devin Goforth. The students’ creativity got the school’s entry into the finals. Now, they are counting on the community to join in the voting to get the grand prize for the school’s art program. National voting opens today and closes on May 4. Individuals can vote once per day at customculture.vans.com.